Dale has been a stylist in Worcester for twenty-five years. Education has been a notable part of his profession. 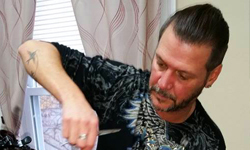 At the start of his career, Dale was an educator for Kenra, where he recognized that no matter how many years of experience a stylist has, you can never stop learning. In the past, Dale has worked extensively with many of the top professional lines available to the industry. These lines include, but are not limited to, Goldwell and Aveda, two of the most reputable and respected product lines on the market. Dale has also undergone training with So. Cap USA, and is certified in Human Hair Extensions. Dale loves what he does and his passion and experience is very much reflected in his work. 1. What was your favorite part of cosmetology school? I enjoyed learning every aspect of our trade. 2. What would you consider your strengths in your career to be? My ability to listen to my client’s wants and needs, while giving them my advice. 3. Why did you aspire to become a cosmetologist? It was always my dream; being a cosmetologist gives me the ability to use my stylish side. 4. Use three words to describe your personal style. 5. What are three words to describe your personality? 6. What is your favorite Hair styling tool? I always loved my sheers the best! 7. What is your favorite thing about styling hair? I love making someone look and feel their best! 8. Name a few of your hobbies other than turning heads. Working out at the gym, motorcycle rides, going to the beach, spending time with my friends, going out to dinner, and I love to dance! 9. What would you say is your favorite hair product? I would have to say that I do not have one because I love them all. Each product is perfect for different people. 10. What makes you unique as a stylist? 11. What is your all-time favorite cut? There have been so many different popular haircuts in my 17 years of being a stylist that I cannot possibly choose one to be my favorite. 12. What do you hope your clients say about you to others, or how would they describe you? I want all of my clients to leave thinking that I am a great artist, and that I am a fun person with energy. 13. If you were not a hairstylist, what else would you be? This is a really difficult question for me to answer because being a stylist has always been my dream. After a lot of thought, I would have to say I would have become a flight attendant. This would be a good career for me because I love people and I love to travel. I think making people happy during their flights would be almost as rewarding as being a stylist. Subscribe for up to date specials and events!